Should your application deployment automation system prepare your data center infrastructure for the static requirements of the application? Or does it adjust the application to suit the situation in which your infrastructure finds itself at the moment? Exploring this question, with code in hand, is Chef. 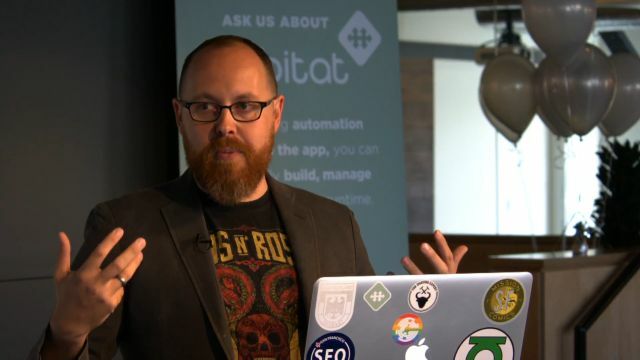 In a streaming public conference Tuesday, Chef chief technology officer and co-founder Adam Jacob [pictured above] introduced Chef’s declarative automation system for deploying applications, called Habitat — a system that will work in tandem with Chef’s namesake deployment automation tool and Inspec, the company’s infrastructure testing framework announced last November. Chef’s stated intent for Habitat is to build a set of instructions that deploy an application in whatever environment happens to be the target at the time. It is not, as Chef’s namesake software has been used to date, a way to configure available infrastructure to suit the demands of an application — or, even more restrictive, to force available resources into a specific condition exclusively suited to the needs of integrating new applications with old ones. Chef is one of a number of companies investigating ways of best bridging the needs of the application with the resources of the infrastructure. We’ve tackled this issue before, including with HashiCorp’s transition from Vagrant to Otto, with Avi Networks’ application delivery controller architecture, with Shippable’s dynamic container deployment scheme, with Ansible’s bid to substitute for docker compose, and with DCHQ’s approach to automating lifecycle management. All of these approaches to application deployment suggest that you implement a big degree of change, leaving something in your automation process behind. “The data is the API” — Chef’s Adam Jacob. Jacob told his audience a story about traditional application lifecycle management and the extent to which Chef has been shaped by traditional enterprises to suit its needs. Assuming that a software project was conceived according to a common vision, he said, its evolution has it bouncing from link to link on its chain of designated departments — development, QA, operations, security. Granted, these chain links can all be codified into pipelines. But the fact that software moves from one point to another single point, he warned, can give developers a myopic perspective with respect to its user, so that it becomes intended for one department at a time, as opposed to the user at large. 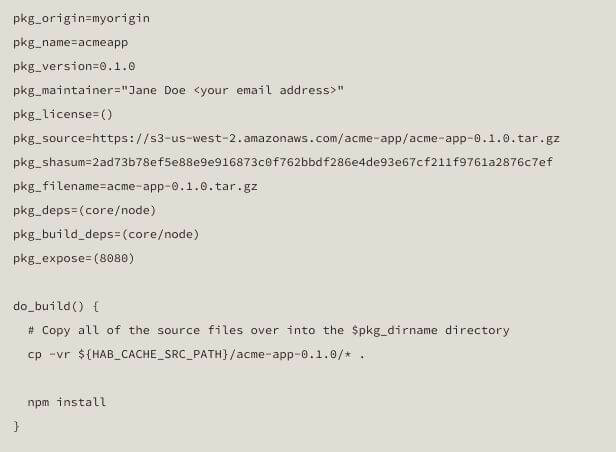 During Tuesday’s live stream, Chef’s Adam Jacob demonstrated how a Habitat package is constructed to deploy a relatively simple service: the redis in-memory data store. A Habitat script [like the one shown above] is called a plan, written in a language created by Chef that’s native to Habitat. Building a plan can be a kind of handheld process, where Habitat leads the user point-by-point through the plan’s generation. For each plan to be authenticated, it requires an origin, which may be the software’s original manufacturer although it may also be the Habitat Core, or for the development process, it may instead be the developer herself, assuming she has her own digital origin key. Rather than the typical Linux configure, make, and make install commands, an application can undergo Habitat’s make cycle without the use of configure, or a configuration script. Habitat can be very conversational with its user, almost like one of Microsoft’s “wizards” but without the GUI. The hab setup command, without embellishments, launches this conversational process that reminds the user what an origin is, and asks her to specify one. Then it gives her the option of turning on performance analytics for the build process, which may be useful later in case errors creep up. Inside each plan’s directory are the configuration options for the application, representing not just anything that’s static but anything else that’s subject to change. Here, these options are specified not in YAML, as some may have expected, but in TOML (Tom’s Own Minimal Language). In a nod to Windows, Jacob said, “What’s great about TOML is that it looks like an .INI file, which we’ve all been writing since the ‘80s. It’s like a key, a value, and an equal sign, and everything’s cool.” Annotations are important here not only for documenting and explaining these options for human readers but for enabling Habitat’s help system to present explanations to other DevOps professionals at the command line, on demand. “It supports complicated data structures, if you need them,” he went on. “Some software — like Apache Web servers, or NGINX — need more complicated data structures to be able to really talk about all the things they could possibly do. They need hashes and arrays, and TOML gives you that with a simple, easy syntax. So it scales up really well.” Plans may contain what Adam Jacob described as “lifecycle hooks,” that customize the behavior of an application depending on the context in which it will run — for example, during health checks. When Jacob executed hab package build redis, Habitat responded by assembling the necessary dependencies, then downloading Redis, compiling it, and placing the product in an artifact, which is an immutable pattern whose contents may be verified by way of checksums. For an artifact to be made available so that its software may be deployed later, Habitat has you send it to a depot (which is a much nicer name than “repository,” which often gets shortened to “repo” anyway) using hab package upload. Chef maintains a public depot of its own. Installing the artifact using the designated plan is accomplished with hab package install origin_name app_name, where origin_name is the identifier for the artifact’s source, and app_name identifies the application. In the demo, Jacob used hab package install adam redis. It does appear here that Chef is using “artifact” and “package” interchangeably here, and this may need to be sorted out over time. Habitat is intentionally designed to be platform neutral, which means it supports containers. Producing a form of the artifact for Docker is a simple string of terms in one command — in the demo, hab package export docker adam redis. For now, Habitat also supports Cisco’s ACI and Mesosphere package formats, but Jacob added that Chef intends for Habitat to support Amazon’s AMIs, as well as VM formats, in coming versions. Running a Habitat package involves a component called a supervisor, which introduces a curious new aspect to the system: clustering. In a multi-tenant environment, multiple supervisors running simultaneously can join forces in what Habitat calls a ring (Obviously, someone at Chef is a Trekker.) When Habitat rings are formed, multiple instances of an application running simultaneously are addressed collectively as service groups. This collective interaction happens automatically, without intervention from a user or an admin or some other script. Inevitably, though, as Jacob admitted, the creation of service groups leads to the necessary creation of topologies, which govern the behavior of each application instance once it has been enrolled in a service group. In one such topology, which Jacob described as “leader/follower,” one instance may host the database that receives all the write operations and most of the reads while the others receive streams of database updates. This is one example of a situation where the same application may end up running a completely different way, once it is installed in the same context with multiple other instances of itself. In the leader/follower topology, for instance, a supervisor elects one instance of an application the leader, thus designating the others followers by default. Typically, enabling the actual behavior that leader/follower entails, could be accomplished by rewriting the application so that an internal API function call contacts a library, creating a new binding. So Jacob’s metaphor is meant like this: Changing the data which designates how an application would behave as a leader or a follower, in the context of a scale-out system, has the effect of hard-coding an API call into the application and rebuilding it, using traditional means — without having to actually do the coding. Chef offers a hosted demonstration of Habitat, along with some documentation. The company will discuss the technology in more depth in a June 29 webcast. The End of Bimodal IT? In an interview with The New Stack, Chef’s Adam Jacob and its vice president for business development, Ken Cheney, spoke with us at length about how their company expects Habitat to be integrated into the production environments of organizations — especially those that already use Chef. That second option may be tempting, from the perspective of a business analyst looking to align Chef and Habitat with the needs of an everyday enterprise. There’s a concept called “bimodal IT” that suggests the duality of an IT organization can be successfully managed, such that slow processes like integration and fast process such as adoption, can successfully coexist. Granted, bimodal is one of the most misinterpreted concepts in business today, even by Gartner itself (a presentation during the recent RSA Conference keynote session elicited audible groans, and a few cat-calls, from the audience). But its basic premise is that not everything or everyone in IT needs to move at the same speed, and thus business processes and development processes may need to be coordinated to take that into account. Arguably, such coordination could take place with the help of an automation system. And the duality of Chef and Habitat could, from one perspective, play into that modality. Chef’s Adam Jacob had a word for that which involves a notable farm animal and its biological processes. Jacob went on to condemn the notion that code, by its very nature, cannot apply to everyone in an organization — one of the common corollaries of the bimodal IT concept. Indeed, Jacob believes that once the symbology of code is rendered in a simple enough fashion, it can inspire everyone in an organization to communicate their ideas about applications and functionality using common objects. Ken Cheney expanded on this: “Sure, you may want to have parts of your organization move more slowly, for business reasons — like, they don’t have to push changes all that frequently. But I guarantee, there will come a time where, whether it’s driven by business reasons like the need to have more intimacy with your customer, or you have a security reason — you want that ability to go faster.